I have been asked to deliver a referee’s seminar in the in UK in late spring. The purpose is to prepare people to take on this onerous task before those currently doing it become too old or too frail or too dead to continue. Unfortunately like death and taxes there is a certain inevitability to becoming a referee, so we may as well try to do it as well as we can. 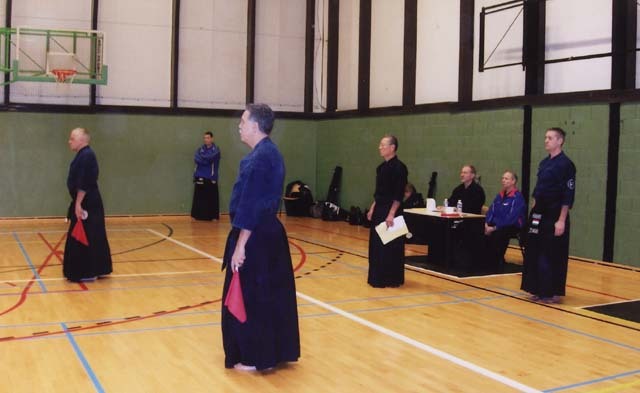 The purpose of refereeing is to decide on valid yuko datotsu – strikes made on target, at the correct distance, with the correct blade angle and sharpness, in high spirits and followed by zanshin. You do this with your eyes and ears and you have to move in a way where you can constantly see both opponents and the signals of our colleague referees. You also have to remember the senkoku commands, the flag signals and be responsible for the safety of the competitors without hindering the flow of the shiai. All of these elements are easily learned, but try them all together and chances are that even the most controlled, rational individual will look like a demented windmill undergoing a bout of Tourette’s. Referees’ seminars can range from highly analytical whiteboard sessions where the finer points of yuko datotsu are discussed in detail to mass flag waving sessions reminiscent of a 1920’s youth rally. My ideal session falls somewhere between the two, with an emphasis on learning by doing, with the help of some constructive criticism from an instructor. Usually space constraints do not allow more than one or two groups of referees to practise at the same time. For a reasonably well attended session, there are bound to be more onlookers than participants, making the 3 unlucky people in the shiai-jo particularly nervous. What should be clear is that everyone is there to learn and we all learn by making mistakes. Once you have made your errors you can then go back to the side-lines and watch others make theirs. As long as you can laugh with, rather than at each other it becomes a rewarding experience. Geoff on A Warrior’s Spirit! Ronald Roen on A Warrior’s Spirit!